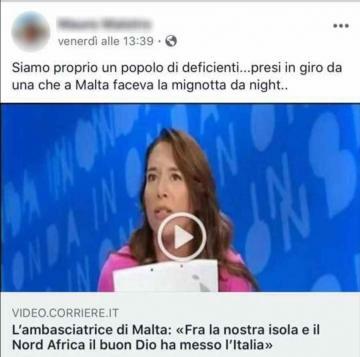 Italy’s government has apologised to Malta after an Italian policeman called Malta’s ambassador to Italy a “whore” on Facebook. In a statement, the Italian embassy in Malta said that foreign minister Moavero Milanesi had called his Maltese counterpart Carmelo Abela to apologise for the “unspeakable” insult directed at ambassador Vanessa Frazier. Ambassador Frazier sparked controversy last week when she told Italian reporters “The good Lord put Italy between our island [Malta] and north Africa”, referring to the Italian island of Lampedusa. That statement echoed a phrase Italy’s controversial home affairs minister, Matteo Salvini, had used back in June when he first announced Italy would be adopting a tough line on migration. “The good Lord put Malta closer to African shores than Sicily,” Mr Salvini had said at the time, having apparently overlooked Lampedusa. The comment prompted a diplomatic incident and an official apology from Italy. Aside from an apology from minister Milanesi, Italy's ambassador to Malta Mario Sammartino has also expressed solidarity with ambassador Frazier. US-educated ambassador Frazier has held a series of top diplomatic posts over a 25-year career with Malta’s foreign affairs ministry. She led Malta’s response to the Arab Spring and won international praise for her leadership in creating and coordinating a humanitarian hub in Malta during the Libyan crisis. Aside from her professional accomplishments, ambassador Frazier was also a national judo champion and represented Malta in a number of international competitions. Speaking to the Times of Malta, the Maltese ambassador she said that she was not ready to draw a line under the matter. “I hope that disciplinary action will be taken against this public officer for his offensive comments,” the ambassador said.